The development of scalable and sustainable regional dashboards against human rights categories, will require collaboration and reuse of existing projects and resources. 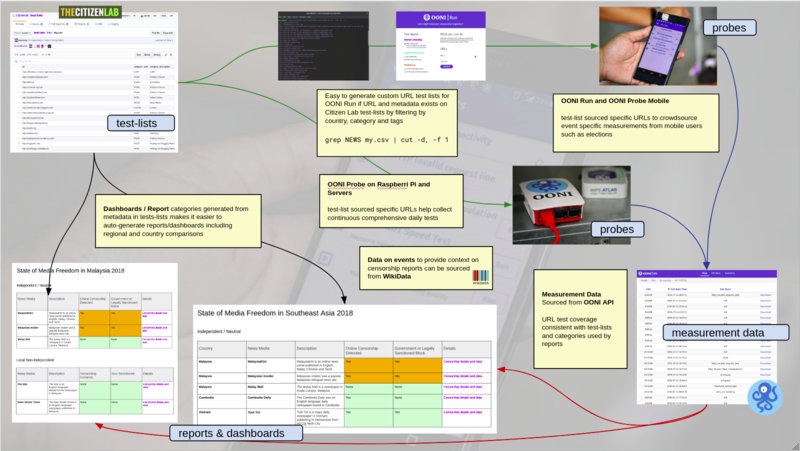 Dashboards will be automatically generated from metadata sourced from Citizenlab test-lists. These same lists are also use as source for tests run by OONI Probe app on mobile phones and computers. Key to this approach are the Citizenlab test-lists. They are used as the source for daily and partial tests from OONI Probe apps. Additionally if there is enough metadata in terms of categorization and tags, they can also be used to auto-generate custom lists for OONI Run such as a set for elections, protests and so on. As the test-lists are CSVs, these filtered lists can be done within spreadsheets by non-coders. This encourages contributions back to the main test-lists instead of throwaway lists of URLs. A simple command line such as this makes it easy to quickly generate a list of urls for OONI Run for News sites in Malaysia. With enough metadata in the test-lists, we should be able to generate the queries need from OONI data to generate various dashboards and views to meet user needs such as State of Online Media Freedom report. As the urls tested are from the same test-lists, there will be some consistency when extracting data from OONI API to generate results for the dashboard. If there is relevant data for urls available but not in test-lists, this again encourages updates to the test-lists so that results will show up in the planned dashboards.